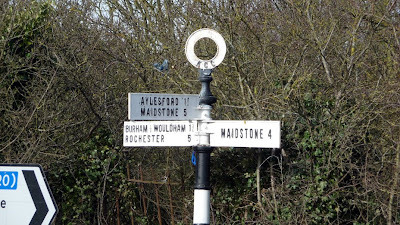 Walking from Aylesford via Eccles, the village just visible in the southwest of the map, I arrive at the junction and turn left towards Burham. Immediately the road turns quite steeply down a hill and round a sharp bend. 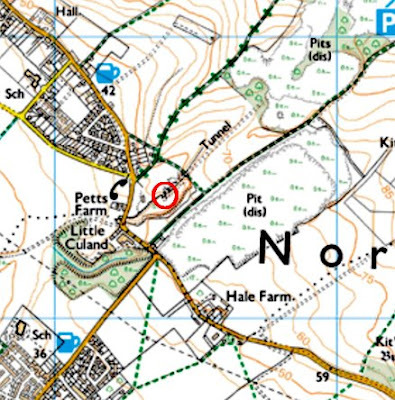 According to the map the path that leads to the tunnel entrance is somewhere around here, but there are no accessible paths from the road opposite Little Culand, Culand Farm and Petts Farm. There is a fence beyond which is a dense overgrown thicket and beyond that what appear to be paddocks. There is no footpath along either side of the road and cars appear quickly around the bend making it impossible to stop anywhere to take photographs. Around the corner on the right there is a bus stop and a byway leading off the road up a slight hill, shown as a green line with cross lines on the map. 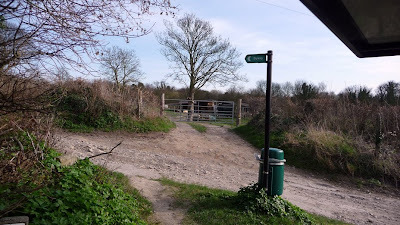 A little way on the right is a bridle path, shown on the map as a broken green line, which I take. It runs along the edge of a field. After a while I reach a short but steep incline to the right of which is a wooded area. With farther exploration I find that the dense thicket here comes to an edge and then a drop of about 20 metres. This, according to the map, is immediately above the tunnel entrance, however looking down I can see no sign of it. From the original photograph it would appear to be set back into the cutting, which might explain why it is not visible from above. Turning left to follow the bridle path it is possible to reach the disused quarry that the tunnel is supposed to lead to, and a strange and interesting landscape it is. I walk a treacherous path around its edge.